Teflon® AF is used in vacuum degassers as well as other low and high-pressure degassers. 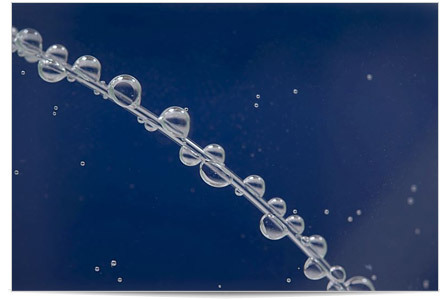 Degassers based on Teflon® AF easily outperform degassers based on Teflon® PTFE. This provides faster degassing response times with shorter lengths of tubing and minimum sample size. Teflon® AF tubing used as a chemical micro-reactor. The combination of high gas permeability and chemical resistance makes Teflon® AF a perfect material for flow-through chemistry apparatus. Teflon® AF has excellent UV light transmission which allows the polymer to be used as a reactor vessel in UV initiated chemical reactions. Teflon® AF tubing and film are used in online transformer oil monitoring. Dissolved gasses are extracted from transformer cooling oil, analyzed, and monitored to control costly transformer failures. Teflon® AF is the only polymer with a refractive index lower than that of water. Total internal reflection occurs when a tube of Teflon® AF is filled with water and used as a waveguide. Teflon® AF 2400 film as thin as 0.0015" (38μm). Teflon® AF 2400 tubing typical minimum ID: 0.0030" (76μm). Typical wall thickness starts from 0.0010" (25 μm).